Keep sleeping, my sweet little boy. It’s your last day to be three or “fwee” as you say. Your legs can only run so hard for so long. It’s a neverending job keeping up with twin big brothers, but you do it so well. Though, you always succumb to the moving van and your broken-in car seat at this time of the day. Those heavy long, bleached-tipped eyelashes win. Again. I wanted to wake you up when we got to the park so you could hide in the bushes with your brothers, but you looked so peaceful. I just couldn’t do it. I really needed to go pee but I just sat holding you on that rock wall. 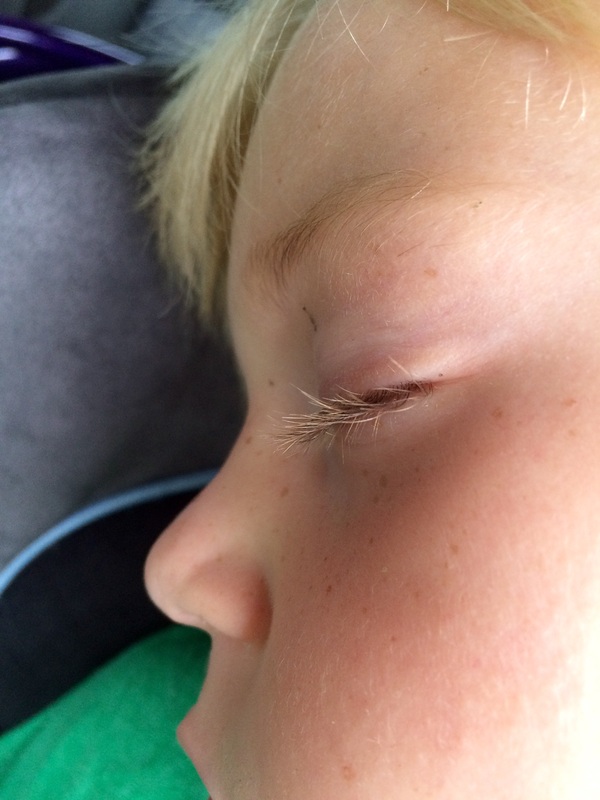 I took a picture of your sun-kissed eyelashes. I absolutely love them. They cast the most perfect summer shadows on your face. They remind me of how the tiniest things can be the most beautiful if we stop and notice. Your brothers keep running over to check on you sleeping on my shoulder. They’re whispering, “he’s still asleep” as they sneak off. They love playing with you. I’m pretty sure everyone loves playing with you. You have always gone with the flow so well. You’re as easy going as they come unless you’re tired and want ice cream for dinner. Then, you can throw yourself on the floor with the best of them. And you’re a strong little boy. Every year, you grow bigger and smarter, and somehow more beautiful than the last birthday. I think and hope the older that you get, the more people you will affect for better. There will be more happy moments because of your influence. More kindness and compassion filling the spaces you go. A trail of giggles and belly laughs you will leave behind. It would be selfish of me to want to keep holding you in my arms forever. You’re meant to thrive and grow and help change the world. For good. Your meant to be shared. Your cocoon is unique and beautiful but it doesn’t begin to compare to the places your wings will one day take you. And what amazing wings you will have. Not quite yet though. Even though you told me that you would be “supa heavy for your birfday,” I think I will still get to hold you a little while longer. Happy Fourth Birthday, sweet Colbs.